Respirocytes are medical science fiction; the idea is to create a bloodborne 1-micron-diameter spherical nanomedical device. Robert Freitas had the idea in 1996 for this artificial red blood cell. It is designed as a diamondoid 1000-atmosphere pressure vessel with active pumping powered by endogenous serum glucose, and can deliver 236 times more oxygen to the tissues per unit volume than natural red cells while simultaneously managing carbonic acidity. An individual respirocyte consists of 18 billion precisely arranged structural atoms plus 9 billion temporarily resident molecules when fully loaded. An onboard nanocomputer and numerous chemical and pressure sensors allow the device to exhibit behaviors of modest complexity, remotely reprogrammable by the physician via externally applied acoustic signals. The intent of respirocytes is to store and transport more oxygen than natural red blood cells. A human being equipped with respirocytes could hold his breath for up to four hours or sprint at top speed for fifteen minutes without even needing to take a breath. As far as I know, the likely development date for these nanodevices is still somewhere in the distant future. We can prepare ourselves for that day by, of course, watching science fiction. Consider the Borg Nanoprobes. These nanoprobes are microscopic machines that inhabit a Borg's body, bloodstream, and many cybernetic implants. The probes perform the function of maintaining the Borg cybernetic systems, as well as repairing damage to the organic parts of a Borg. 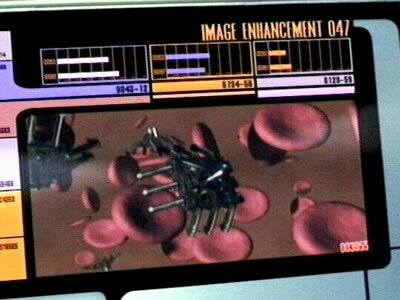 They generate new technology inside a Borg when needed as well as protecting them from many forms of disease and virus. Hopefully, injection of respirocytes won't require "assimilation" into the Blue Cross/Blue Shield collective. From respirocyte and Borg nanoprobe; thanks to Moira for suggesting this story, and to Yossi for improvements.